Audition now for full time in 2019 at Lee Academy! 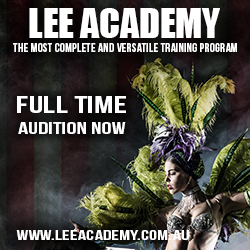 Lee Academy Fulltime makes the link for dancers from students to professionals. Providing a guided career pathway for aspiring performers & giving you every opportunity to expand your skills, nurture your versatility & explore your artistic self expression. Our fulltime courses get you a huge leap closer to your dream & guide you into a successful professional career, with the Nationally recognised qualification to go with it. Lee Academy has fierce & progressive full time courses that are completely unique - as a leader in the industry, Lee Academy has the authority (& the privilege) to deliver its own uniquely developed & highly successful full time courses that are nationally accredited by the Australian Government. Our courses are flexible, responsive to our dancers' needs & what the industry is looking for at any given time.